Pack your bags and head to 'Owl Little Lake House,' a 3-bedroom, 2-bathroom vacation rental house close to Lake Eufaula. This home offers over 1,500 square feet, accommodations for 11, and a large scrapbooking and quilting room. Lake Eufaula is the largest lake in Oklahoma and is home to world-class fishing. This home is ideal for large groups that want to get away from the hustle and bustle of everyday life. When you walk into the house you immediately notice the vaulted ceiling in the living room with exposed beams, a wood-burning fireplace, sumptuous leather couch, and a leather recliner. The large, fully equipped kitchen has all of the comforts of home and makes cooking savory meals easy with modern appliances. Pull out a chair at the circular dining table with seating for four to enjoy your dinner. There is also a cafe bar in the dining room with 3 bar chairs for seating. The garage is a scrapbooker or quilters paradise with multiple work tables each equipped with a light to illuminate your projects. There is also a flat-screen cable TV in the garage to keep you entertained. Grab some fresh air on the covered back patio which features ample seating for everyone in your group. When your day is done, retire to one of the 3 bedrooms to rest your head. The Zebra Room and Red & Tan Room both feature 2 twin-sized beds with the Zebra room offering an additional rollaway bed and the Red & Tan Room offering a trundle option. The Black & White Room features 3 twin-sized beds with an optional trundle, or request to have 2 twin beds converted into a king-sized bed. The home is located just steps away from Lake Eufaula, the largest lake in Oklahoma with 600 miles of shoreline. The lake draws anglers from all over to try their hand at largemouth bass, smallmouth bass, Kentucky bass, and much more. Take a trip to Lake Eufaula State Park, a 102,000-acre reservoir with hiking, horseback riding, and more. A boat ramp is conveniently located at the end of the street so you can bring your own boat and explore the lake. History was made at the Honey Springs Battlefield, where an American Civil War engagement took place. The Battle of Honey Springs was the largest confrontation between Union and Confederate forces. Every year there is a reenactment of this historic battle and visitors are welcome to watch history. 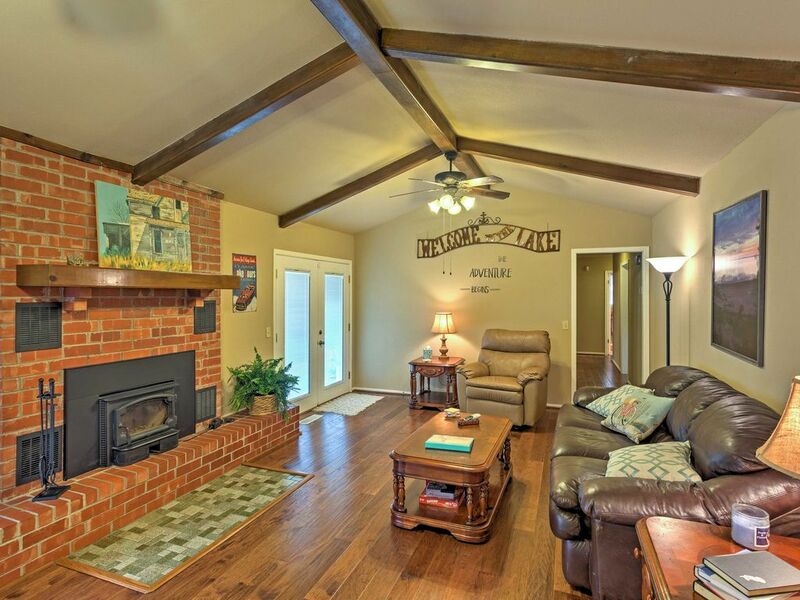 - Great location within Rolling Oaks that is only approximately 200 yards from Lake Eufaula, with Honey Springs Battlefield about 15 miles north, the town of Checotah is about 9 miles north, the town of Eufaula is about 7 miles south, both with great shopping and restaurants! This house was perfect for our party of 7. We enjoyed meals and playing games around the dining room table, cooking together in the huge open kitchen, sharing coffee on the comfortable back porch, and being just a few short minutes from a sandy beach. Terry was a very attentive host and easy to communicate with. The house was spotless, well stocked, and nicely organized. The two kids in our party absolutely loved the finished garage, with its own tv, games, and AC. It was easy to clean up after ourselves with the provided laundry soap, dish washer soap, paper towels, etc. The circular floor plan makes it easy to accommodate a large number of people. This is a quiet neighborhood and an extremely reasonable price for a relaxing weekend. Beautiful clean home. Host was very friendly and accommodating. We had a wonderful time with the family and a few friends. The game room/ hobby room was a hit! Really close to the boat ramp. We could unload the boat and then park at the house. The living area was large and comfy. Kitchen was just right, and 3 separate bedrooms gave everyone their own space. Plenty of activities at the house - it was funny watching our teenagers play croquet (and play it several times). If you’re headed to Lake Eufaula, I highly recommend this house! The house exceeded our expectations. We were actually shocked at how clean and nice it was. It is It is within walking distance to a large sandy beach and right next to a boat ramp. Terry, the owner, was a joy to interact with. She was great and we look forward to going back. Definitely recommend for a getaway.